This 1995 single, from the soundtrack to the Batman Forever movie, was a track the band started writing during the Zooropa sessions in 1993. The track became an ever-present during the encore of the PopMart Tour in 1997 and a live version from the show in Mexico in 1997 was released on the limited-edition CD, Hasta La Vista Baby, produced for Propaganda subscribers. The video for the single, directed by Kevin Godley and Maurice Linnane, featured the band as cartoon characters performing in Gotham City, with Bono battling between two of his onstage personas - The Fly and MacPhisto. 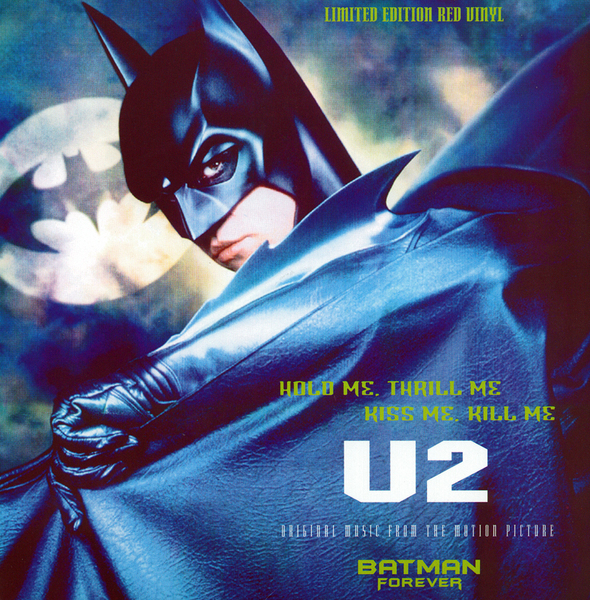 "Hold Me, Thrill Me, Kiss Me, Kill Me" was the lead track off the Original Soundtrack 'Batman Forever' which also included Seal's "Kiss From A Rose" and contributions from PJ Harvey, The Offspring, Mazzy Star, Massive Attack and Eddi Reader. In 1996, "Hold Me, Thrill Me..." was nominated for two Grammy Award's, 'Best Rock Performance by a Duo or Group and Best Rock Song. "The post-ZOO TV U2 seem like the perfect musical amabassadors for Hollywood's third installment of the Batman saga, BATMAN FOREVER. Just like Bruce Wayne, they are so constantly play-acting (is he Bono or is he The Fly?) that "reality" seems to veer with perspective; and just like original director Tim Burton's Gotham City, U2 now exists in a vacuum driven by old vices and new technologies. So, "Hold me, Thrill Me, Kiss Me, Kill Me," the band's T-Rex meets SoulIISoul contribution to the album, holds up equally well as a U2 track and as the film's theme, exploring the dualities of superficial contentment and inner turmoil." “Hold Me, Thrill Me, Kiss Me, Kill Me” is one of U2’s (particularly Bono’s) most self reflecting songs. I feel the song is about becoming a rock star and the pitfalls that are associated with it if one is not careful. The song has a very hypnotic quality to it and is the song that first introduced me to U2. I have always been a Batman fan and the song was featured on the soundtrack to “Batman Forever.” The accompany video for the song sees U2 traveling to Gotham City where “Thy Fly” and “MacPhisto” from Zoo TV cross paths. The video also gives us a glimpse at the inspiration for Zoo TV’s colorful characters as “The Screwtape Letters” by C.S. Lewis is read by Bono. Looking back, I really did not understand what the song was about when it came out as I was very young but I just knew I was seeing and hearing a great band in a Batman movie. This song will always be special since it was the song that started my discovery of U2. I was ecstatic when U2 brought the song back for the 360 tour. The song has such power behind it with Adam and Larry driving the grove.